At White Wing Fields you’ll be hunting along the banks of the historic Rio Grande River. The hunting lease measures close to 400 acres. Limit out on your next trip. ATTENTION: This Year the First Special White Wing Hunt is a Sunday/Monday. 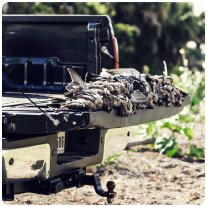 White Wing Fields offers the finest dove hunting in the state, if not the country. For over 25 years we have cultivated nearly 400 acres of sunflowers and other forage specifically for white wing and mourning dove. Located on the banks of the Rio Grande, just outside Brownsville, TX, our fields are magnets for birds on both sides of the border, as well as for migratory birds later in the season. We have the combination of food, water and roosting habitat doves require. 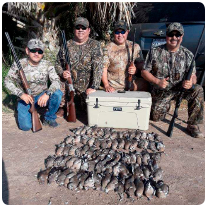 We are an easy drive from either South Padre Island or Arroyo City, so if you are vacationing or fishing in those places, consider adding a bird hunt. We carefully manage the pressure on our fields to ensure the longest, most productive season possible. Putting tremendous early season pressure on productive fields is the quickest way to ensure that birds quickly abandon those fields. By rotating fields, capping the number of hunters and selectively cutting and harvesting, we ensure optimal conditions. Hunters routinely set up shade tarps, bring tailgate grills and coolers and generally make themselves at home. We want everyone to feel at home. We have placed trash barrels for hulls all around the fields and ask that everyone please pick up their used shells and trash and dispose of those properly. We also carefully manage the hunter experience. Dove hunting over very large fields works best when there are enough hunters to move birds around the field, but not so many that it is unpleasant or uncomfortable. 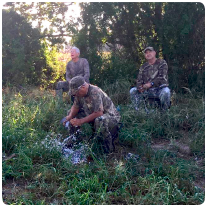 We work carefully to space our hunters to ensure field coverage and safety. We are the choice of many corporate clients as well as South Texas fishing guides and outfitters. About 70% of our business comes from repeat clients which is a testimony to our commitment to both the quality of hunting and the level of service. So come on down and enjoy South Texas’ finest dove hunting. We are here to help with anything you might need, so please do not hesitate to contact us or to book a hunt directly. Bienvenidos! 400+ Acres along the banks of the historic Rio Grande River. Half is planted with sunflowers, corn, grain and soybeans which acts as a natural magnet for the droves of dove found in our sub-tropical climate. 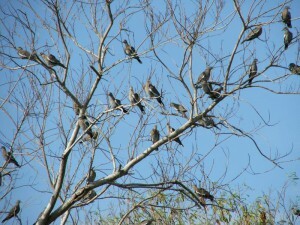 a division of White Tipped Dove, LLC.